Looking to get vertical this winter in the Adirondack Park? It's time to take on the adventure of ice climbing! The Adirondacks offer amazing ice climbing challenges for people willing to give it a shot. Ice climbing is a winter activity that involves ascending inclined ice formations, such as crevices and cliffs covered in ice. Think rock climbing, just on ice! Ice climbing is different from mixed climbing, which involves both ice climbing and rock climbing. How Can I Ice Climb Safely? 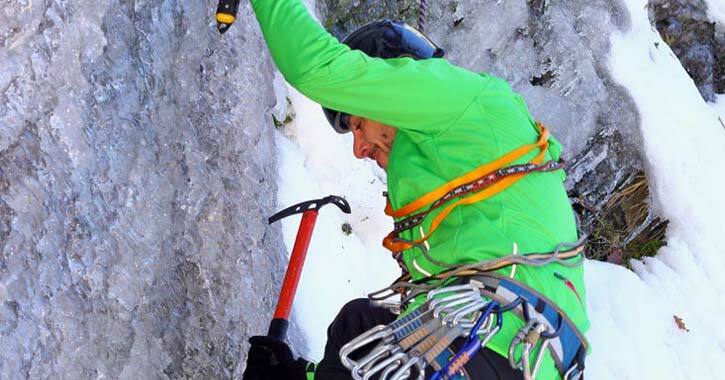 Ice climbing is a potentially dangerous activity, so being prepared is a top priority to ensure your safety. If you're just starting out, then the number one tip to keep in mind is to go with a friend or someone who has ice climbed before. Teaming up for an ice climbing adventure will be safer and just as fun. In addition, make sure you have all the necessary ice climbing gear, including glacier glasses, gloves, an ice tool leash, ice axes, hammers, and crampons/proper footwear. You should make a checklist of everything you need before you go ice climbing. Once you have everything you need, the next step is to make sure you know how to ice climb correctly. Do some research on how to use each tool and then practice on a small inclined ice formation first. It's also essential to assess the weather conditions and map out your route before you take on the challenge. Plan ahead, and let someone know that you're going ice climbing. When is the Best Time to Ice Climb? The best time to go ice climbing in the Adirondacks is from late November through mid-spring. Of course, this depends on how much ice has formed in different regions of the park. Where Can I Go Ice Climbing in the Adirondacks? Below, you'll find a list of some ice climbing hotspots in the Adirondacks. If you are unsure of your climbing skills, enroll in a climbing school and/or hire a guide. A few hours of instruction will be worth every penny when you are hanging off an icy incline. Always climb with others until you feel skilled enough to solo climb. Make sure someone knows where you planned to climb and when you planned to finish. Pack energy food, water, and emergency supplies just as you would on a hike.